It was the third week of November, about a week before Thanksgiving, and although it had snowed up in the White Mountains earlier in the month, there had been a warm-up and it had all melted. Taking advantage of the what might prove to be the last nice snowless day of the fall, I took off work and headed up to climb the Kinsmans. I had never approached them from the west before, only via Lonesome Lake and the Fishin' Jimmy Trail, and I was looking forward to trying out the less-travelled route up the Mt Kinsman Trail. 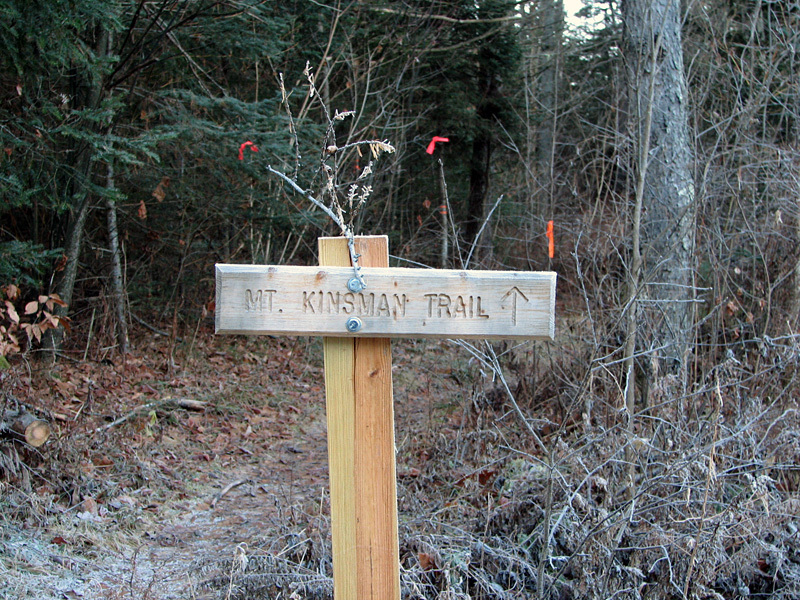 The Mt Kinsman Trailhead had recently been relocated a few tenths of a mile down the road, a new section of the lower trail now avoided following what had once been a reportedly poorly-marked route on forest roads and driveways. It was, however, supposed to be difficult to find the trailhead on Rt 116 near the Easton/Franconia town line. After passing it up once and turning around, I found the entrance to the trail's parking area, partly because I had seen a picture of it online the day before, and was soon headed up the trail. The newly-relocated section was easy to follow, and after about 15 minutes of winding through a relatively flat hardwood forest, met up with the former route near an abandoned sugar house. From there, the trail still followed a quiet and peaceful country lane/forest road, which after about a half hour of easy hiking, met up with an old logging road. 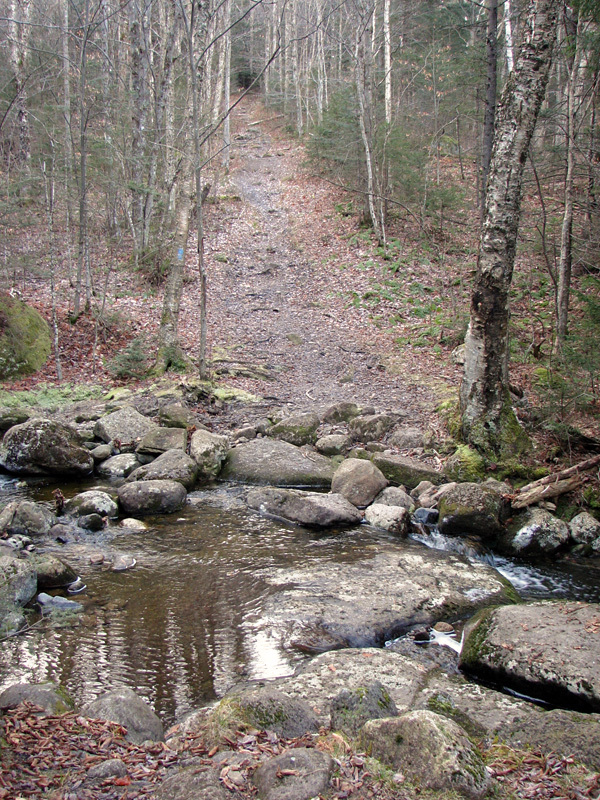 After crossing a small brook, the trail finally began climbing at a moderate rate. The walking was still easy and quite pleasant. At the top of a short straight incline, the trail crossed another brook, where a small, but nice waterfall cascaded down a smooth ledge. Although there wasn't any snow on the ground, there were occasional patches of ice, including one muddy area that had frozen, and some interesting ice crystals had formed in the mud. About an hour and a half after leaving the trailhead, I reached Bald Peak, which is about 2/10 of a mile off the main trail on a spur. 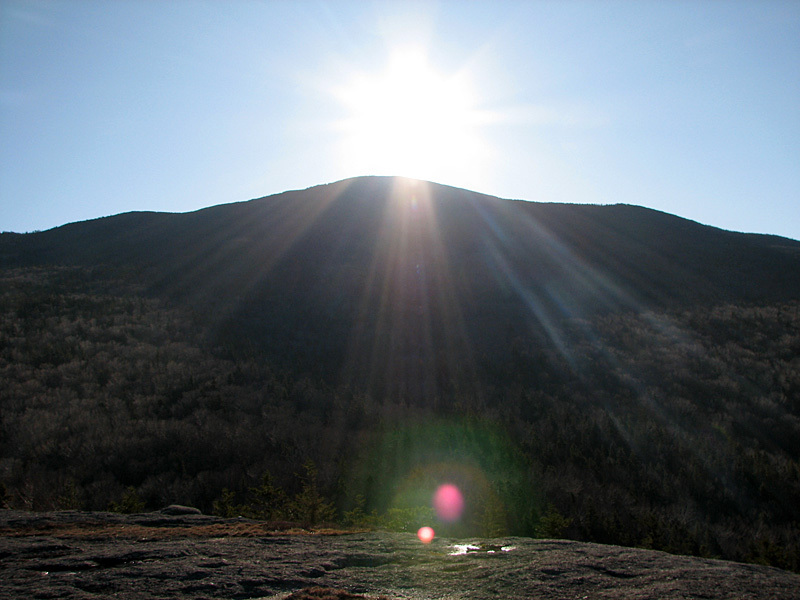 There are many small mountains in New England with names like Bald Peak, Bald Mountain, and Bald Knob, including this one which is marked Bald Peak (Easton) on the map. 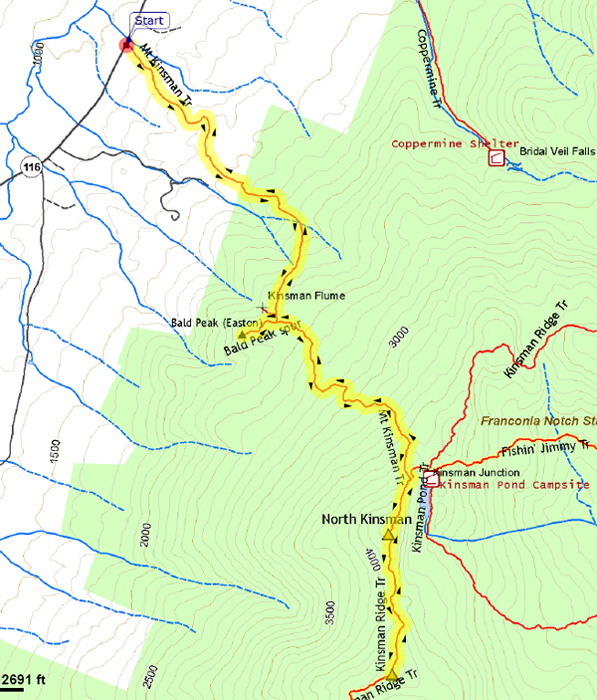 Another is Bald Mountain at the north end of Franconia Notch, reached by a popular loop trail that also passes Artist's Bluff. The views were pretty good from this summit, and while not spectacular like those of the Franconia Range from its taller neighbors, could still warrant being considered as a destination by itself in the shorter/less strenuous hike category. I had been hiking mostly in the shadows all morning, but the sun was finally beginning to rise over North Kinsman. In the shorter days of mid-November, the sun was hidden behind the Kinsmans until around 9:30. Trailhead. 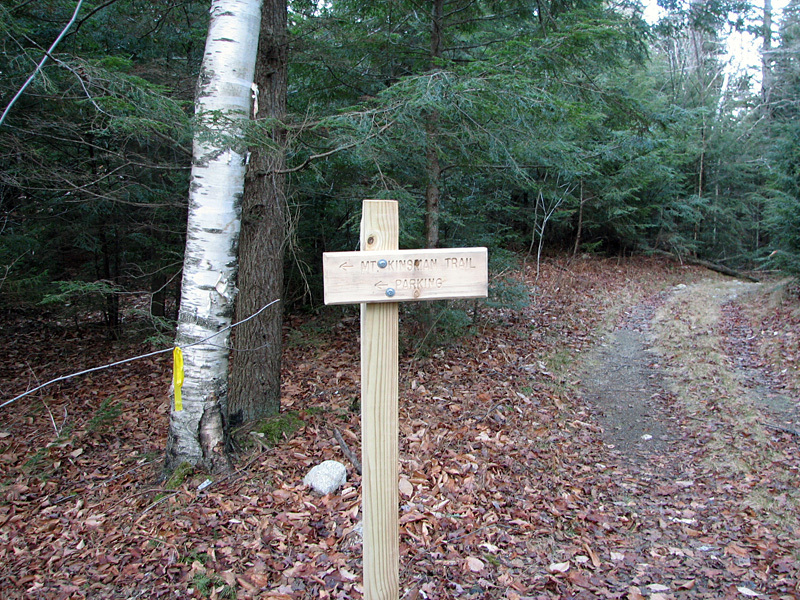 The Mt Kinsman Trail begins in a small parking area off NH 116 near the Franconia/Easton town line. The trailhead was recently relocated. Junction with old trail. About 15 minutes after leaving the trailhead, the newly-relocated trail joined the old route. Old sugar house. 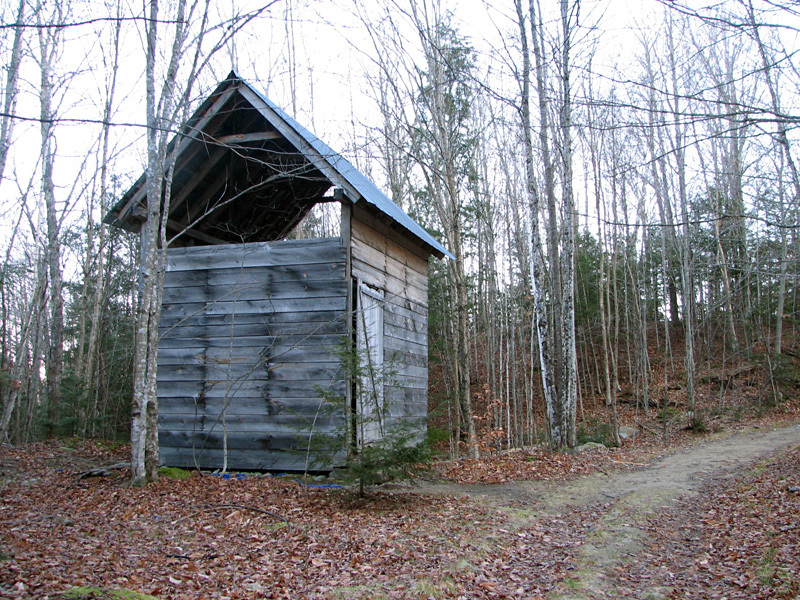 This small abandoned sugar house, where maple sap was boiled to make maple syrup, was just beyond the junction with the old trail. Brook crossing. Just before beginning to gain some elevation, the trail crossed this small brook. Waterfall. 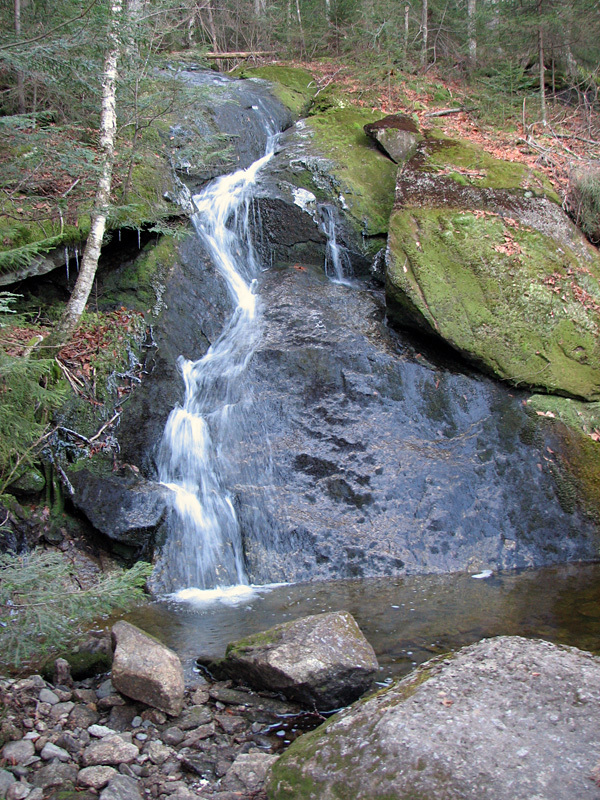 A short distance further up the trail, it crossed another brook, where this small waterfall cascaded down a ledge. Ice crystals in the mud. 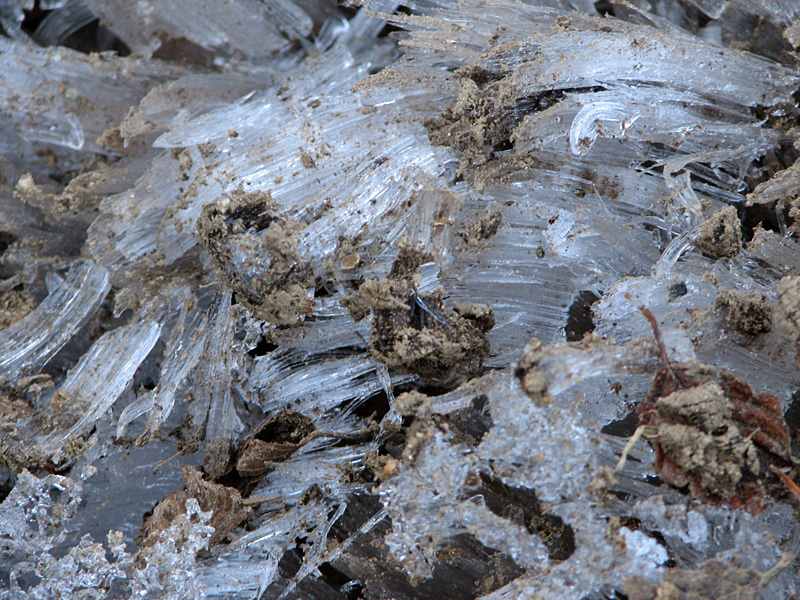 Sub-freezing temperatures has caused ice crystals to develop in a muddy patch on the trail. Bald Peak in Easton. This is a minor summit on the way to N Kinsman. There are many small mountains named Bald Peak or Bald Mountain. including one at the north end of Franconia Notch. Sunrise over N Kinsman. The western slopes of the Kinsman range finally emerged from the shadow of N Kinsman around 9:30 AM in the shorter days of mid-November.